I’ve made no secret of the fact that Paul Sahre is one of my very favourite graphic designers, so when I saw that he was looking for sponsors for a new project through Kickstarter, it was a no-brainer that I was going to contribute. “Saturn V Relaunch” is a photography project and book that will see Paul rebuilding and launching a Saturn V model rocket, some 40 years after his father tried to do the same thing. Paul’s design and 70s era rocketry = awesome in my books. Paul describes the project as “a shot at dad redemption… in order to introduce two boys (his sons) to the grandfather they will never know”. Going back to the end of the Apollo space missions on the early 1970s Paul remembers his father – an aerospace engineer – building a Saturn V model rocket. 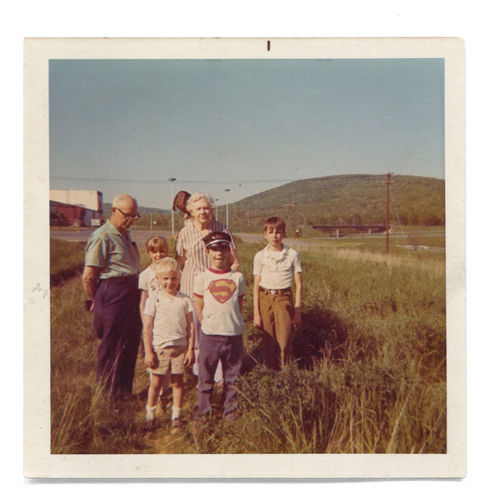 After months of cutting, gluing, sanding and painting, Paul’s father launched the rocket in an open field, only to have the chutes fail, and the model rocket plummet back to earth. Paul remembers this as the first time he ever saw his dad fail – at anything. So when he recently discovered the launch pad in his now late father’s attic he decided to take the experience full circle by trying to launch the rocket again. In Paul’s words, “Saturn V Relaunch is a tribute to the days before NASA cutbacks when every kid wanted to be an astronaut in order to explore the unknown, if only in our own backyards And to all of the model rockets that caught fire on the launch pad, exploded mid-air, were lost in a tree or disappeared from sight, never to be seen again.”Saturn V Relaunch sees Paul building another Saturn V model from the same vintage Centuri model kit his father used (he found one on eBay). Upon completion, the rocket will be launched publicly from Sahre’s father’s 40-year-old launchpad. The entire process and the launch, which is planned for the second quarter of 2013, will be documented and self-published as an art/photo book, which Sahre will write and design himself. There is also a plan to produce a short documentary on the Saturn V Relaunch. 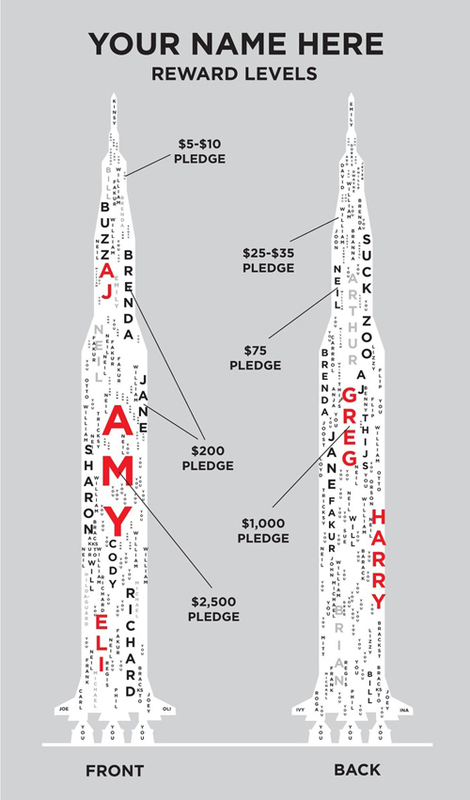 The cool part is, every Kickstarter backer gets their name affixed to the exterior of the rocket, which Paul is “envisioning as” a Nascar type situation, with the rocket covered with names”. For Paul the project is about more than a model rocket. It is “about a time machine posing as a model rocket”! But it is also about exploring “some basic ideas that we can all relate to: memory, family (specifically fathers), loss, trying again, and what (and how) we pass on to our children”. So for five bucks you can be a part of this project, and if you’re feeling even more generous, there are various rewards offered at various money donation levels. I’ve found donating to Kickstarter projects to be a very rewarding endeavour in the past and I’m looking forward to seeing the results of this one later in 2013.